I’m taking a break from my dates at Granville Island so that Cagey Bee Headquarters can swing into full production mode as we get ready for the holiday craft fairs & Christmas markets. 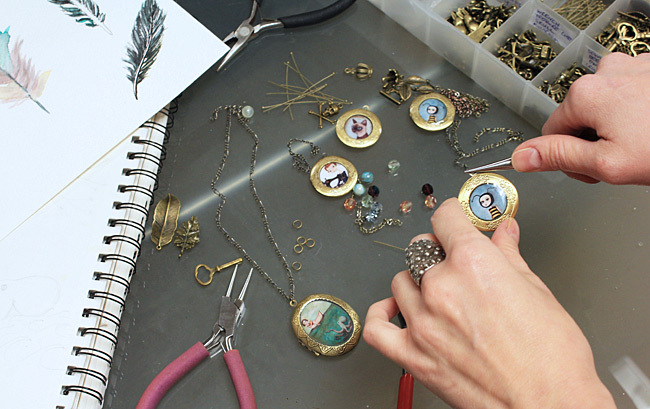 I’ve been making new lockets, my mister (a.k.a. Cagey Beard) has a table full of wood blocks to sand & I’m crossing off the days until the first show of the winter season – which is also the biggest – Circle Craft. With less than 2 weeks to go, I’m nervously trying to keep moving forward, getting things done & preparing myself to accept that I probably won’t get every single thing finished. Every year I have grand plans of completely redesigning my booth, updating my website, painting a new series of paintings, launching a few new products AND making sure I also stay on top of the appropriate press releases & manage a social media campaign. Vancouver locals – click here to see the rest of my market events for the season. Previous postOne More Day to Save!